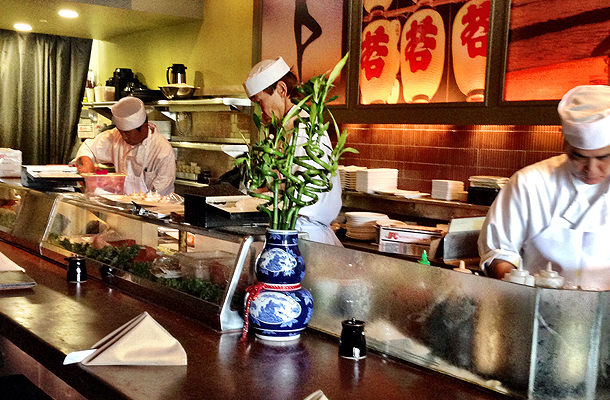 Located in the Malibu Colony Plaza, Bui Sushi is the perfect spot to stop for your sushi fix in the Malibu area. From the moment you walk in, you’ll be blown away by the authentic décor and warm staff who will welcome you into the restaurant. From the flaming fire pits to the palatable sushi menu items, there’s no doubt that this is Malibu’s hidden gem restaurant. The remarkable thing about Bui Sushi is that, it’s not just the food that draws guests to stopping by, and locals to come back night after night. Believe it or not, the atmosphere of Bui itself makes it a comfortable environment that allows guests to sit back, relax and take a load off while sipping a cocktail and enjoying a meal. When in Bui Sushi, each guest will enjoy his or her meal in a unique dining room, offering an upbeat environment, a chick lounge and cozy patio area with plenty of space for dining. Their top-of-the-line sushi chefs create the most unique and best quality sushi in town, that doesn’t only taste fresh, but is displayed so well you won’t want to eat it! Regardless of what your palette has a taste for, there is always something at Bui to satisfy your sushi craving. Take a seat at the sushi bar and be prepared to have your mind blown at the best quality sushi and sashimi you’ve ever had. Not only do they offer great sushi, you can also enjoy several traditional Japanese entrees that are will leave you full and satisfied. For example, Bui Malibu’s original signature dishes are a hit among the Malibu community. Their specialty Sushi Rolls and Hamachi Carpaccio are popular lunch meals, and their Black Cod With Miso is what keeps guests coming back for more. If you’d like to check out Bui Sushi, be sure to visit them at 23733 Malibu Road, Malibu, CA, or check them out online at: www.buisushi.com.